Asthma is a chronic lung disease and a very common respiratory condition. It is also known as a reactive airway disease which is inconvenient most of the time but manageable. Asthma attacks all age groups but often starts in childhood. It is a disease characterized by recurrent attacks of breathlessness and wheezing, which vary in severity and frequency from person to person. In an individual, they may occur from hour to hour and day to day.This condition is due to inflammation of the air passages in the lungs and affects the sensitivity of the nerve endings in the airways so they become easily irritated. In an attack, the lining of the passages swell causing the airways to narrow and reducing the flow of air in and out of the lungs. 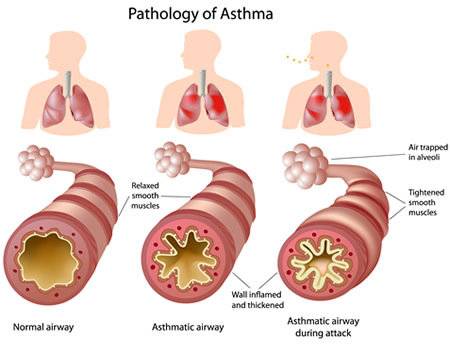 Asthma is caused by inflammation and constriction of bronchial walls due to hyper-reactivity of their smooth muscle, thereby leading to a series of spasmodic attacks of wheezing and shortness of breath (SOB). Various factors can contribute to the cause of asthma: exposure to cigarette smoke, climate change, physical exertion or emotional stress. It normally begins during childhood and the disease is commonly triggered by viral infection. Asthma can be diagnosed by the presence of the various signs and symptoms. Diagnosis is normally confirmed by presenting a response to a inhaled bronchodialator. In addition, pulmonary function tests, chest x-rays and blood tests can also be carried out to confirm the diagnosis. In childhood, the first symptoms may appear before the age of five years. However, diagnosing asthma in young children under 5 years is difficult due to the fact that other childhood conditions may have similar symptoms. Therefore, the doctor is reliant upon the child's medical history, their symptoms and physical examinations in order to confirm a diagnosis. Moreover, the doctor could also carry out a 4-6 week asthma medication trial and monitor the child's response (US department of health and human services 2009). According to the Global Burden of Disease Study (GBD), the most recent revised global estimate of asthma suggests that as many as 334 million people worldwide have been diagnosed with the condition. The majority of people affected are in low- and middle-income countries, and its prevalence is estimated to be increasing fastest in those countries. In South Africa, particularly Durban and Soweto, there has been an increase in hospital admissions over the past 25 years, with reports of a 25-200 times increase . For South Africa, the mortality rate was estimated to be 77.6 deaths per one million people. It has the second largest mortality rate in the world after South Korea with 86.9 deaths per one million people, followed by Georgia with an estimated 59.2 deaths per one million people after South Africa. In the UK, approximately 5.4 million people are currently receiving treatment for asthma, this includes 1.1 million children (1 in 11) and 4.3 million adults (1 in 12) . This means that asthma affects 1 in 5 households in the UK. Asthmatic conditions normally begin before the age of 5, however it can occur for the first time at any age, even in adulthood. If asthma occurs for the first time in adulthood, the condition will usually persist, whilst children often outgrow it in their teenage years . On average, 3 people a day die from asthma. Although the UK still has some of the highest asthma prevalence rates in Europe, its prevalence is thought to have plateaued since the late 1990s. In Scotland, approximately 368,000 (1 in 14) people are currently receiving treatment for asthma: 72,000 children and 296,000 adults. The UK NHS spends in excess of £1 billion a year treating and caring for people with asthma, whilst in Scotland the spend is in excess of £130 million . Asthma has many possible causes as the exact mechanism of onset is still unknown. This is due to asthma not being defined as a single disease, but a variety of multiple diseases with similar clinical features, resulting from different genetic and environmental causes  mainly developing at an early age, The complex interplay between hereditary and environmental factors which are occurring at this critical time in development, lead to the onset of the disease . Patients who are atopic have a genetic predisposition for developing the disease due to a hypersensitivity of the airways to environmental triggers. An allergic reaction to antigens that normally do not cause a response, predisposes to asthma onset demonstrating the genetic component of the disease. Asthmatics can commonly suffer from other allergies including food, drug and skin allergies . The increased prevalence of asthma in developed countries and urbanised areas  supports the theory of environmental exposure contributing to the disease. Sufferers are chronically-exposed to substances when inhaled lead to an allergic response in the airways. 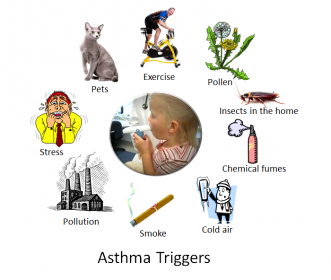 Asthma triggers initiate an asthma attack. Some causes of the manifestation of asthma may also trigger an attack. In asthma, airway constriction is caused by a combination of bronchial constriction (bronchoconstriction) and bronchial inflammation. This leads to chronic lung pathology in which the bronchial airways are prone to narrowing, causing episodes of wheezing, chest tightness, coughing and breathlessness (SOB) that range in severity from mild to potentially life threatening. Entrance of allergens through the oral or nasal cavity results in swelling of an already compromised and highly sensitive airway . As a result, constriction of smooth muscle in the walls of the airway and excessive release of mucus into the area causes airway narrowing and ultimately reduces the amount of air circulating in and out of the lungs . Due to these differences in airway flow rate, the lungs become hyperinflated. When the tidal volume (VT) of the lungs reaches a capacity similar to that of the pulmonary dead space, it is termed alveolar hypoventilation and results in a ventilation-perfusion (Va/Q) mismatch. This Va/Q mismatch is ultimately worsened by vasoconstriction . A reduction in arterial oxygen supply (hypoxia) can result from the Va/Q mismatch. Diffusion of carbon dioxide (CO2) across the alveolar capillary membranes prevents high levels of carbon dioxide in the blood (hypercapnia) during the early stages of an acute asthmatic exacerbation/attack. Therefore, although these patients have hypoxia, the low levels of oxygen (low PaO2) trigger hyperventilation and therefore decrease PaCO2 to prevent hypercapnia and the retention of carbon dioxide. During the first stages of an acute episode, alveolar hyperventilation can result in respiratory alkalosis. However, if airway obstruction worsens and there is a further increase in Va/Q mismatch, it can lead to CO2 retention, hypercapnia and compensatory metabolic acidosis. In some chronic asthmatic patients, limitation of airflow may only be partially reversible. This is a result of airway remodeling from the chronic untreated condition, more specifically hyperplasia and hypertrophy of smooth muscle, angiogenesis, and sub-epithelial fibrosis in the tissues of the airway. It is also called intrinsic asthma and it usually develops after the age of 30 years where allergies do not play any role.Non-Allergic (intrinsic) asthma is triggered by factors not related to allergies, it is likely triggered by respiratory irritation substances (e.g cleaning agents, perfume and smoking). Like allergic asthma, non-allergic asthma is characterized by airway obstruction and inflammation that is at least partially reversible with medication, however symptoms in this type of asthma are not associated with an allergic reaction. Many of the symptoms of allergic and non-allergic asthma are the same, but non-allergic asthma is triggered by other factors such as anxiety, stress, exercise, cold air, dry air, hyperventilation, smoke, viruses or other irritants. In non-allergic asthma, the immune system is not involved in the reaction. Exercise induced asthma is a type of asthma triggered by exercise or physical exertion.It affects anyone and at any age. It is caused by lack of heat and moisture in the lungs which occurs during strenuous exercises. Many people with asthma experience some degree of symptoms with exercise. However, there are many people without asthma, including Olympic athletes, who develop symptoms only during exercise. With exercise-induced asthma, airway narrowing peaks 5 to 20 minutes after exercise begins, making it difficult to catch your breath. The symptoms begin within few minutes of exercise and peak or worsen a few minutes after stopping exercise. Symptoms of an asthma attack which is wheezing and coughing may be present. It is the asthma that's caused by breathing in chemical fumes, gases, dust or other substances in the working environment. Occupational asthma can result from exposure to a substance the victim is sensitive to — causing an allergic or immunological response — or to an irritating toxic substance. Like other types of asthma, occupational asthma can cause chest tightness, wheezing and shortness of breath. People with allergies or with a family history of allergies are more likely to develop occupational asthma. Asthmatics will present with varying signs and symptoms depending on disease classification and severity. Asthma attacks will exasperate symptoms leading to medication administration. Symptoms most commonly occur early morning, at night or during an attack . These symptoms occur due to the pathophysiology of the disease. Bronchoconstriction causes an audible wheeze and subsequent cough. Chest tightness can be felt and a shortness of breath (dyspnoea) from a constriction of the bronchial walls. Sputum is produced due an inflammatory response in the airways  adding to the difficulty of breathing. Asthma is an obstructive lung disease. Narrowing of the airways (bronchospasm) due to constriction of the bronchial muscles in the wall, lead to decreased air flow and difficulty with breathing. Bronchospasm causes decreased peak expiratory flow rate, which in turn leads to decreased PaO2 and increased PaCO2 of the blood. Heart rate increases to compensate for a lack of oxygen being transported in the blood. To increase oxygen during inspiration, hyperventilation will occur in the patient. However work of breathing will be increased due to the narrowed bronchi which make it more difficult to breathe . When does asthma become life threatening? When these signs and symptoms presents, a person should be aware and are advice to consult with your general practitioner as soon as possible. identify the aggravating factors e.g. smoke, dust, etc. Many substances can trigger allergies and the same applies to asthma. Common allergens that triggers asthma are pollen, mold, dust mites and pet dander. Other irritants are smoke, pollution fumes, sprays and cleaning chemicals. Asthma symptoms can therefore be reduced by avoiding exposure to known respiratory irritants and allergens. The patient is initially asked to explain their various symptoms, including their description, frequency, duration and aggravating factors. Substance exposure may have also lead to the onset of asthmatic symptoms, in which case exposure to tobacco smoke, chemical fumes, dust or other airborne irritants is determined. Additional questioning may include relevant health problems, the patient’s occupation and medications that may cause airway irritation. If the patient has a family history of asthma or allergies, they are more likely to also suffer from asthmatic symptoms. The patient’s skin will also be examined for signs of allergic skin conditions (e.g. eczema and hives). The following tests are used to assess the patient’s breathing as well as to monitor the effectiveness of asthma treatment. Spirometry may be used to assess lung function by measuring the amount of expired air as well as the speed of expiration. It is used to confirm the presence of airway obstruction and can accurately measure the degree of lung function impairment. Spirometry is used to measure the sensitivity of the airways and lung function during physical activity, or following the inspiration of increasing doses of cold air or a special chemical However, it is only recommended for adults and children over the age of 5. 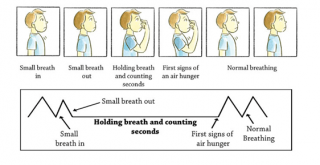 Peak flow testing is a self-assessment lung function test using a peak flow meter to provide an objective measure of airway function based upon peak expiratory flow rate (PEFR). Peak flow is described as the highest airflow velocity that can be achieved, with any drop in the peak flow measurement indicating airway obstruction. Asthma in older adults is frequently underdiagnosed and has higher morbidity and mortality rates compared to their younger counterparts. A detailed history and physical examination as well as judicious testing are essential to establish the asthma diagnosis and exclude alternative ones. Medical comorbidities, such as cardiovascular disease, cognitive impairment, depression, arthritis, gastroesophageal reflux disease (GERD), rhinitis, and sinusitis are common in this population and should also be assessed and treated. Non-pharmacologic management, including asthma education on inhaler technique and self-monitoring, is vital. Various medication exists that help the control of asthma by reducing inflammation of the airway and bronchial constriction, these medications are administered orally, via aerosol or an inhaler. (Cleveland Clinic. 2009). Pharmacologic management includes standard asthma therapies such as inhaled corticosteroids (ICS), inhaled corticosteroid-long acting β-agonist combinations (ICS-LABA), leukotriene antagonists, long acting muscarinic antagonists (LAMA), and short acting bronchodilators (SABA). Newly approved biologic agents may also be utilized. Older adults are more vulnerable to polypharmacy and medication adverse events, and this should be taken into account when selecting the appropriate asthma treatment. Non-pharmacologic management, including asthma education on inhaler technique and self-monitoring, is vital. Short-acting beta 2-agonists (quick acting or rescue medicine): these drugs are used best to treat sudden and severe or new asthma symptoms as they open the airways and relieve symptoms within 20 minutes and lasts four to six hours. It can also be used before physical activity about 15-20 minutes before the time to prevent exercise-induced asthma. Long-acting beta 2-agonists: these drugs are not used to for a quick relief of asthma symptoms, instead they are used to control symptoms and their effect lasts 12 hours. The majority of patients suffering from asthma will seek physiotherapy for dyspnoea and hyperventilation . Physiotherapists treat asthma in a variety of ways with the aim to improve breathing technique. Physiotherapy techniques for asthma are in addition to medication and should never be used as a replacement to prescribed medication, however may reduce the dosage required. These retraining techniques help control breathing and reduce airflow turbulence, hyperinflation, variable breathing pattern and anxiety. The Buteyko breathing technique is another breathing retraining technique; however it is specific to reducing hyperinflation. It was developed based on the theory that asthmatic bronchospasm is caused by hyperventilation, leading to a low PaCO2 and therefore all asthmatic symptoms are due to this. The narrowed airways induce an “air hunger” causing a switch to mouth-breathing and an increased respiratory rate leading to hyperinflation. Buteyko believes that this hyperinflation then also contributes to bronchoconstriction. The Buteyko technique aims to reduce ventilation and subsequently lung volume, as a treatment for asthma and other respiratory diseases. A qualified practitioner is necessary to train the patient . Breathing pattern retraining and relaxed breathing techniques are two approaches to physiotherapy management of asthma. The aim of breathing pattern retraining is to develop a more efficient pattern of respiration, thereby reducing breathlessness. This is usually accomplished by slowing the breathing rate, and encouraging relaxed, ‘abdominal’ breathing (Bruton, 2006). Another potential mechanism for breathing pattern retraining is that by encouraging a longer expiratory time, the effects of any static/ dynamic hyperinflation may be reduced. Mild asthmatics can hold their breath for up to twenty seconds, moderate asthmatics for fifteen seconds and severe asthmatics for up to ten seconds. The aim of this method is to increase the control pause to 60 seconds and the maximum pause to 2 minutes. It is practiced twice a day, with the practitioner there to help with breath holding and ensure safety. Its aim is to reduce minute volume through reduction of respiratory rate, and increasing carbon dioxide levels through breath holding, reducing bronchospasm caused by hyperventilation in the asthmatic patient. Physical training with asthma is advised when taking the proper precautions, and should not be avoided. The American College of Sports Medicine (ACSM) Guidelines provide tips and safety precautions for asthmatics to exercise safely. Physical training should be prescribed by physiotherapists for asthmatics to increase fitness and cardiorespiratory performance, reduce symptoms such as breathlessness and improve quality of life . Breathlessness, chest tightness and wheezing can occur when exercising, deterring patients from physical exertion . Fear avoidance can contribute to a further deterioration of physical health and quality of life, leading to anxiety and depression. It has been shown  that maintaining physical training in asthmatics improves disease symptoms and quality of life, therefore making it a crucial management strategy. Breathing exercises are carried out using an external device to make breathing more difficult. This helps to strengthen the inspiratory muscles, making it easier to breathe in everyday life. A breathing device is used which sets up a load to breathe against. During inspiration air is only released if enough effort is used to force open the valves of the device. Respiratory muscles are forced to work harder, increasing their strength, leading to diaphragmatic breathing becoming easier, reducing hyperinflation. Range of motion exercises for patients who need hospitalisation. Unfortunately, there is no cure for this illness but there are ways of effectively managing the disease. However, this should involve the active participation of both the person suffering from the disease and his/her doctor. Due to the high prevalence of asthma and associated healthcare costs, it is important to identify low-cost alternatives to traditional pharmacotherapy. One of these low cost alternatives is the use of inspiratory muscle training (IMT), which is a technique aimed at increasing the strength and endurance of the diaphragm and accessory muscles of respiration. IMT typically consists of taking voluntary inspirations against a resistive load across the entire range of vital capacity while at rest. In healthy individuals, the most notable benefits of IMT are an increase in diaphragm thickness and strength, a decrease in exertional dyspnea, and a decrease in the oxygen cost of breathing. IMT has been shown to decrease dyspnea, increase inspiratory muscle strength, and improve exercise capacity in asthmatic individuals. Also, in a systematic review done by Vera et al. (2012),it was found out that exercise can provoke asthma symptoms, such as dyspnoea, in children with asthma. Exercise-induced bronchoconstriction (EIB) is prevalent in 40–90% of children with asthma. and it was concluded physical exercise is safe and can be recommended in children with asthma. A training programme should have a minimum duration of 3 months, with at least two 60 min training sessions per week, and a training intensity set at the (personalised) ventilatory threshold. Another systematic review by Cristina et al (2018) demonstrated that aerobic physical exercise may improve nocturnal asthma in children and adults by reducing the prevalence and frequency of nocturnal symptoms. Specialised in asthma, to help with reducing symptoms and recognising triggers. To provide help, education, medication advice and general information. Advice on proper to diet to not induce symptoms. Asthma may not be fully preventable due to the pathology progression and the differing possible causes of onset. However, there are ways of avoiding triggers for the disease and reducing symptoms. Being aware of triggers is vital on an individual basis as these will differ amongst sufferers. Before the onset of disease, a child should avoid causes of asthma such as passive smoking, damp and dusty living environment and allergen exposure, as well as all possible causes for the disease. However, development can be hereditary and may not be preventable. To prevent asthma attacks, precautions should be made to avoid exacerbations of symptoms and to be aware of the signs of an attack. A physiotherapist works with the patient to promote a healthy lifestyle benefiting the patient in identifying triggers, reducing symptoms and preventing disease progression. Education, advice and physiotherapy techniques help in the overall outcome of the disease. ↑ Mome, M., Gupta, R., Farr, A., Heaven, M., Stoddart, A., Nwaru, B.I., Fitzsimmons, D., et al, 2014, "Estimating the incidence, prevalence and true cost of asthma in the UK: secondary analysis of national stand-alone and linked databases in England, Northern Ireland, Scotland and Wales—a study protocol." BMJ open 4, no. 11: e006647. ↑ Ober C, Yao T. The genetics of asthma and allergic disease: a 21st century perspective. Immunol Rev 2011;242(1):10-30. ↑ LeSouef P. Genetics of asthma: What do we need to know? Pediatr Pulmonol 1997;24(S15):3-8. ↑ Ober C, Hoffjan S. Asthma genetics 2006: the long and winding road to gene discovery. Genes Immun 2006;7(2):95-100. ↑ Beasley R, Crane J, Lai CK, Pearce N. Prevalence and etiology of asthma. J Allergy Clin Immunol 2000;105(2):S466-S472. ↑ Hough A. Physiotherapy in Respiratory and Cardiac Care: An Evidence-Based Approach. Nelson Thornes; 2013. ↑ Mu M, Ye S, Bai MJ, Liu GL, Tong Y, Wang SF, Sheng J. Birth weight and subsequent risk of asthma: a systematic review and meta-analysis. Heart Lung Circ. 2014;23(6):511-9. doi: 10.1016/j.hlc.2013.11.018. ↑ Lemanske RF, Jackson DJ, Gangnon RE, Evans MD, Li Z, Shult PA, et al. Rhinovirus illnesses during infancy predict subsequent childhood wheezing. J Allergy Clin Immunol 2005;116(3):571-577. ↑ Fogarty A, Britton J. The role of diet in the aetiology of asthma. Clinical and Experimental Allergy 2000;30(5):615-627. ↑ Bousquet J. Global initiative for asthma (GINA) and its objectives. Clinical and experimental allergy: journal of the British Society for Allergy and Clinical Immunology 2000;30:2-5. ↑ National Asthma Council Australia. Asthma and lung function test, 2012. ↑ Evans CM, Kim K, Tuvim MJ, Dickey BF. Mucus hypersecretion in asthma: causes and effects. Curr Opin Pulm Med 2009 Jan;15(1):4-11. ↑ Anees W, Moore VC, Burge PS. FEV1 decline in occupational asthma. Thorax 2006 September 2006;61(9):751-755.